Little things that sometimes happen and sometimes make a fuss that is when we come to the office / to the workplace was not carrying a mobile phone. And that day is the schedule of meetings with clients, who happened to number only in the mobile phone contacts. Impact, we must inevitably return to the home. For those of you who often experienced the same sense-itneeds to to consider to have this unique tool. Is Bringrr, a simple tool designed especially for you 'is always close' to the phone's pet. 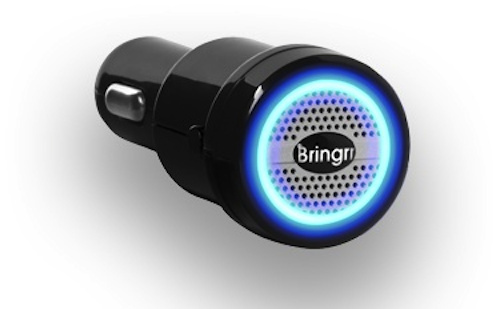 Bringrr has a simple working method, where the latter tools will be installed at the port charger / cigarette lighter in the car. Armed with Bluetooth Bringrr facilities will be connected to mobile phones (pairing). Later when the ignition is turned on, which eventually Bringrr will live, this tool will issue a special tone colors plus blue LEDs. But, if it turns out there's no phone in the car behind it Bringrr alias will make itself sound a warning notification, where the lights had changed to red. And, we also learned that the phone yet we carry. Simple but effective. To have it, simply by paying for $35. Self-worth with the benefits provided.